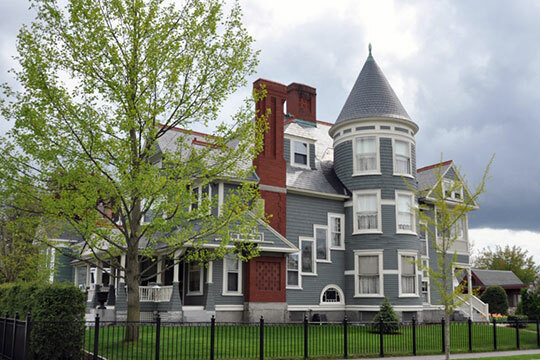 Manchester City Hall is located at 904 Elm Street, Manchester NH 03101; phone: 603-624-6455. Photo: Roger Sullivan House, ca. 1892, 168 Walnut Street, Manchester, NH. Listed on the National Register of Historic Places in 2004. Photographed by user:Magicpiano (own work), 2012, [cc-by-3.0 (creativecommons.org/licenses/by/3.0)], via Wikimedia Commons, accessed January, 2015. Manchester is the county's most important city, located in the eastern part of the county, and mainly upon the eastern side of the Merrimack River. Incorporated in 1751 (then called Derryfield), it was settled as early as 1736 by Archibald Stark (father of General John Stark) and others. In 1775, the town contained only 285 inhabitants. The present population  is nearly 30,000]. The rise, growth and prosperity of this, the largest city in the State, has been almost wholly dependent up its great manufacturing interests, especially its large corporations: the Amoskeag Cotton and Wool Company (1830), the Stark Mills Company (1838), Manchester Print Works (1839) and the Manchester Gas-Light Company (1841), the Manchester Locomotive Works, and the Manchester Water Works.